Behind The Thrills | Dutterer Goes to AdventureDome! Dutterer Goes to AdventureDome! Over the last 12 years, I have visited Las Vegas numerous times. Throughout these visits, I have visited all of the many attractions that Vegas has to offer. Last week, I was visiting Vegas with my brother and father celebrating my father’s recent retirement. As my brother and myself live in areas with an amusement park off-season, Pennsylvania and North Carolina respectively, we were both craving a ride on any roller coaster that we could manage. So of course we made a little bit of time to visit the Adventuredome in Circus Circus Hotel and Casino. The Adventuredome is an indoor amusement park housing about 25 rides and attractions. The park opened in 1993 and unlike the casino is it attached to; it is still in very nice shape. We only had a short amount of time there, so we headed straight to the reason we were visiting, the Canyon Blaster Roller Coaster. 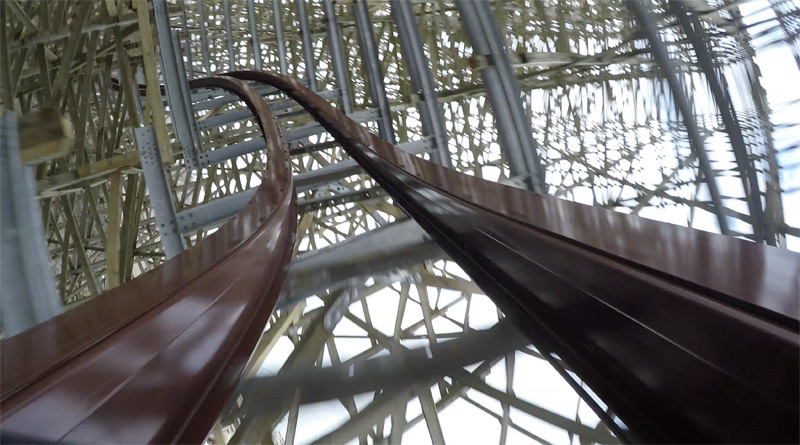 The Canyon Blaster is an Arrow roller coaster featuring 4 inversions: 2 loops and a double corkscrew. Even though I have ridden it in the past, I was pleasantly surprised with our 3 rides on it. The Canyon Blaster still provides a pretty smooth ride especially for a 17-year-old Arrow. The first drop only measures about 65 feet but delivers a pretty good punch. The first two loops are solid followed by a very nice double corkscrew. After the four inversions, you take a short little ride through the scenic canyon and back to the station. Overall, the Canyon Blaster still provides a pretty good ride and in my opinion is the best roller coaster in Vegas. It is absolutely worth a short little side trip if you find yourself spending a few days in wonderful Las Vegas.